Bows by the Miles: My hair bow models! 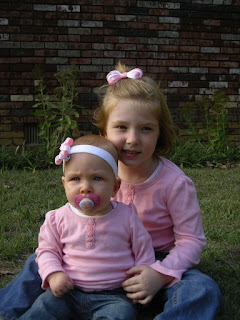 Here are a few pictures of my daughters modeling my hair bows. This will give you a better idea of the sizes of the bows. All of the bows (french clip and alligator clips) can be clipped onto infant and girl's headbands. Riley has very little hair so she still wears infant headbands with all of her bows. 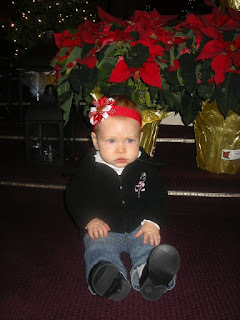 Riley wearing a University of Georgia themed football hair bow clipped onto an infant headband. **Set of 6 infant/toddler headbands in various colors purchased at Wal-mart. 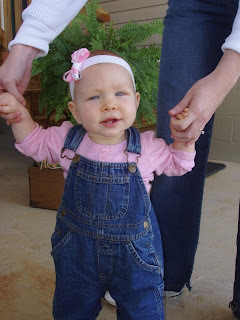 Riley wearing The Chandler II again clipped onto an infant headband. Chandler wearing The Chandler. Both bows in pink and white. Riley wearing The Riley. White, Red and Red/White polka dots with Gingerbread man embellishment. Chandler wearing The Chandler in University of Georgia Red, White and Black polka dots. Bow is clipped onto a regular girl's headband (Set of 6 headbands in various colors purchased at Wal-mart). Chandler wearing The Classic Bow clipped onto a girl's headband. Take a look at what we have! Riley wearing one of our bows! Shipping & Handling Costs are $3.00 for the first item and $1.00 for each additional item.